Take my word for it, it’s very easy to take your sweet time renovating a house when you don’t have to live in the space that you’re renovating and you can just go upstairs when you’re done for the day and forget about the massive chaos underneath you. This house has been like Frankenstein’s monster for a long time, sort of cobbled together with no real direction of what it could be. It’s an upper and lower apartment and for many years I rented out the downstairs portion, but there came a time when having my own space (as in a whole house and not a whole apartment) became more important than having rent income rolling in. Luke moved in and thus the great remodeling of 2013 began. We stupidly thought it would be not a huge job, renovating the downstairs. We decided not to turn it into a technical one-family home but wanted to keep the apartments separate — having a separation of Luke’s office from the dogs was important due to his allergies (although now after living here two years combined with my superior vacuuming skills he’s hardly allergic to the dogs anymore. That also might have something to do with the hospital grade air purifier we have, but I’m SUPER good at vacuuming now.) It would be nice to have a “sometimes but not always dog free” zone for things like dinner parties, fragile stuff, and leaving something out on a counter without wondering if someone will eat it. I love the dogs, life would be boring without them, but when you have dogs that are so large they can get things off the top of the fridge it makes normal people things hard. It also makes it tricky to have people over who don’t LOVE dogs and don’t mind a 130 pound Great Dane plopping down on their lap when they sit on the couch. It’s time to finally tackle the kitchen downstairs. For the last two and a half years it’s served as a storage space for all the construction materials, paint cans, extra tile, drywall, shop vacs (why do we have THREE? It’s a mystery) that go along with this sort of thing. With our wedding quickly coming up I realized we really had to get on this because way back in September when we got engaged and picked an August date I told my brother and his kids that they could stay here while they’re in town for the wedding. Aside from that though, I just want it done. I have no idea what we’re going to do with the upstairs kitchen yet. I have a feeling it might turn into a giant pantry or something like that to house the tons of kitchen stuff that I have that I don’t use every day. The way the house is set up it’s going to make it difficult to sort of integrate it with the rest of the house since knocking down a wall or two isn’t an option (yet) so an appliance storage space would be a pretty decent option..
Over the last week I’ve been taking off the cabinets, cleaning them, sanding them, priming them. Originally all along the plan was to do a two-tone kitchen with white upper cabinets and grey lower cabinets, but I came across a photo of a kitchen with blue lower cabinets and it looked so great I decided that was what we needed to do. I’m not sure if that’s a good idea or a bad idea yet — the photo that I saw had giant windows with amazing natural light as well as a soaring ceiling, of which I have neither. If it turns out to be a mistake hopefully we only have to live with it for a year or two when we do a proper remodel — but I can tell that anything will be better than what is down there now. It wouldn’t be a remodel without a few wrenches thrown in the mix, naturally. We had been out looking at floors (goodbye, horrible peel ‘n stick tile that looks like it was done in the dark. Why are there so many gaps between tiles?) and countertops as these are two things that really need to be changed out. The whole kitchen is very “landlord’s special” and the yellowish brown laminate countertops are more evident of that than anything else. And the horrible lighting. And the ugly cabinet hardware. 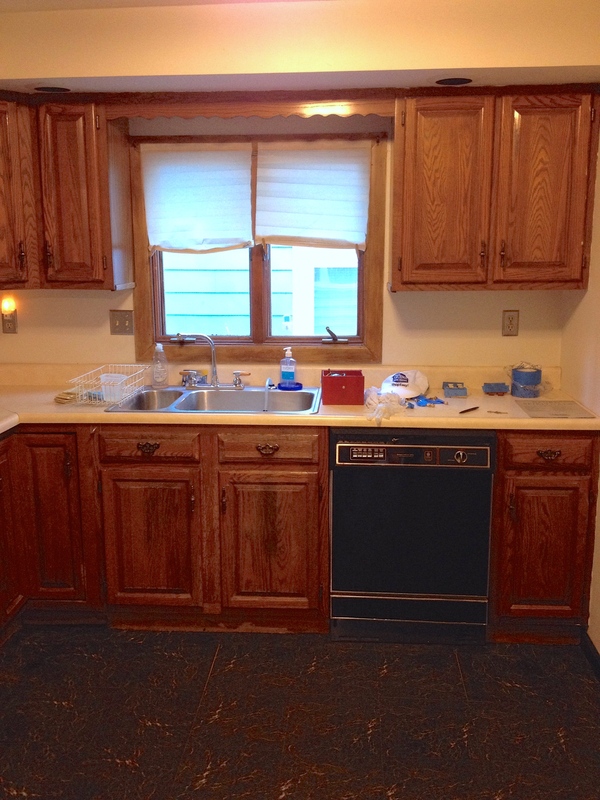 Like imagine if you were a landlord and maybe hated your tenants — this is probably the kitchen you would give them. I’m not sure when it was last remodeled, maybe early ’80’s? It’s awful, really. After looking at countertops we had been thinking of what to do and weighing our options, but the curveball thrown was our Great Dane Kemper being rushed suddenly to the emergency vet and racking up a whole kitchen remodel’s worth of vet bills. I can’t say I really care because I’m just so happy that our dog is alive. I’d live in a house that is 100% walled with brown paneling and wall to wall carpet with foam drop ceilings if it meant saving my dog’s life. Luckily, our kitchen situation is not THAT drastic and it’s just a matter of getting very creative with budget and where we can save money. Obviously number one is doing it ourselves. I thought that I took a ton of ‘before’ photos but so far I’ve only come across these two of the kitchen. The quality is horrible but part of how bad they look is because the kitchen really IS that bad. They bring up so many unanswered questions. Why is there no backsplash other than just painted drywall? Who thought that scalloping above kitchen sinks was a good idea? Is that dishwasher from the ’70’s? Can I polish this turd? One thing that I really hate that I will have to learn to live with is the ceiling. There’s that soffit with the lights in it in front of the cabinets, and the rest of the ceiling is about twelve inches higher than that, but still about eight inches lower than the rest of the house. It just makes an already small space feel so much smaller. If I had my way I would rip down the whole drywall ceiling, fix the “real” ceiling underneath it (which I’d be scared to see why they covered it in the first place) and then take down the cabinetry and just raise them up, but that is way too big of a job to take on at the moment so that’s in my “future kitchen plans” list. So for the time being the plan is paint cabinets, do something to the countertop “for now” that doesn’t involve $75 a square foot granite, maybe a new floor if we can swing it. To the right of the photo is a door and blank wall with nothing else on it except an outlet — who knows what eventually will go there. It’s a little relief that we’re only doing things to last a little bit because hopefully that will give me a chance to really decide how I want things to be in here for the long haul. You know those dishes that just can’t be healthy? Well, there’s probably “healthy” versions of them out there that wind up nothing like the actual thing it starts out as, except in name. I bet chilaquiles is one of those things — the type of recipe where they say “replace the tortilla chips with kale chips, nobody will even notice the difference!” I have nothing against eating healthy and do so as much as I can manage, but chilaquiles is something that you just have to accept that you’re eating your caloric intake for the day and plan accordingly (to sit on the couch and watch Netflix because you basically ate nachos for breakfast) Chilaquiles are commonly a hangover food, and although I hadn’t been out drinking the night before I can really see why this is something you’d crave after a night of rolling in at 4 a.m. We don’t have many nights out regularly that late anymore, but next time we inevitably do I’ll probably think of making this dish as I drag myself out of bed the next morning. It’s a simple dish and much like the acharuli khachapuri that I made a few weeks ago, everyone has their own way of doing things. So many decisions. To make chilaquiles rojo or chilaquiles verde? What kind of cheese? Eggs or no eggs? Any sort of protein or just a plate of sauce-coated chips hidden by tons of melted cheese? The one thing that everyone seemed to agree on was that the chips MUST be homemade and that attempting to use bagged tortilla chips would turn into a sad crumbly mess. After looking at what I can only assume is every single chilaquiles recipe on the internet, I chose to keep things basic and go with this recipe on Epicurious. Also, if I had to pick a recipe I’ve made more times than any other it would be this Mexican shredded beef. I can’t even imagine how many times I’ve made it and every time now it’s different than the last, but the core of the recipe stands time after time. I always make it with a giant hunk of chuck and leave it in the oven for hours. It freezes and reheats amazingly and you can put it on anything to it approximately 900 times more delicious. I remember a few winters ago we were stranded due to the Polar Vortex along with some friends that got stranded at our house and all I had was chuck and masa flour in the house so we ate tacos until the storm blew over. Anyway, I had made this the night before so knew the leftovers would be the best addition to the chilaquiles. I also had made crema that I planned to slather all over the top of the chilaquiles but for some unknown reason it turned out really watery. Too bad, it’s always a nice addition. The red sauce was the component that took the longest to make — once that was done it was all just assembly. Unlike nachos, you toss the chips in the sauce to get them coated which means that after broiling them it’s more like a casserole than nachos. There was still plenty of crunch (thank god — the thought of mushy tortilla chips is nauseating. Or maybe since these were fresh and homemade they get soggy at a different rate? Is there science on this yet? Maybe I need to perform some nacho-related experiments. ) Once the chips were evenly coated I topped them with scrambled egg as it’s my preference over fried. (Scrambled, poached, hard boiled, then fried. I know I’m missing the other 50 ways to cook an egg but as far as breakfast-y techniques that’s the general order!) and the leftover magical taco beef, queso fresco cheese and Monterey jack, popped it under the broiler for a bit and it was one of those things when it came out all I could think about was stuffing the whole thing in my face right then. This was my favorite food I’ve made in a long time. It was seriously incredible and now I want to make all the different variations that I can find everywhere and order it at every Mexican restaurant I step foot in. Hungover or not, you need this dish in your life. The only downside of this dish was having to scrub clean every single inch my my oven. There was only less than an inch of oil in the pan and I left it there to cool. And then forgot about it. And then it was knocked over by a dog, because that is apparently what happens to everything in this house — I swear I know better than that, to just leave things out, and I’m not sure how I overlooked it because I’m pretty vigilant about putting stuff away. Anyway, we went out for a while and came home to see peanut oil dog paw prints all over the place (AFTER I had spend about 9 hours spring cleaning every inch of the house the day before…) The issue was that the oil spilled all over the stovetop. It took a few days to clean and get the balls turn it on — I was dramatically waiting for an explosion or fire or something horrible, but I guess my cleaning skills are up to par since everything works fine! I went out with some friends recently and had the most awful cheeseburger: dry, bland, unseasoned – pretty much most boring food I could imagine. It makes me sad. At least I was in good company so the food was secondary. Also my “please no pickle on the burger or on the plate” was only sneakily honored when I saw the waitress stop before our table to throw the pickle in the garbage before she set down my plate. I know requesting no pickle anywhere near my food might seem on the really picky side of things when it’s something I could just give to someone who does actually eat pickles, which there is no shortage of, but pickle juice gets everywhere and on everything. It makes the fries soggy and makes the bun saturated with its distasteful pickle acid and it just grosses me out — of course I could have made a big deal, but I’d never be THAT much of a jerk to say “Okay, there’s technically no pickle on the plate right NOW, but I saw what you did…” However, one thing I couldn’t ignore was that my cheeseburger had no cheese on it. Cheese on a hamburger isn’t just some random topping — it makes a dumb old hamburger into something amazing and delicious. Not this one though — even cheese couldn’t save it. I had never made cheeseburgers before, or even thought about it. I guess since it’s one of those things that’s so easy and cheap to get pretty much everywhere I never saw the point, but with the thought of the disgusting burger still lingering in my mind I thought I’d see if I could do a better job. I toyed around a lot with the idea of making homemade buns, decided not to, but then at the last minute I found myself facing an evening alone with crummy weather surrounded by all the ingredients I happen to need to make buns. I’m glad it worked out that way because they were amazing and EASY. I thought it was going to be way more of an ordeal than it was but I threw on some music and it came down to mix stuff, let stuff sit, see if you can poke it without your fingers being covered in dough, let it sit. roll, shape and bake. It all sounds so simple and it actually was. There’s a lot of recipes and variations on buns, but everything in this recipe from Epicurious I had on hand so it’s what I went with. I do hold the belief that the bun can make or break the burger. What good is an amazing patty if it the bun is a soggy falling apart mess? 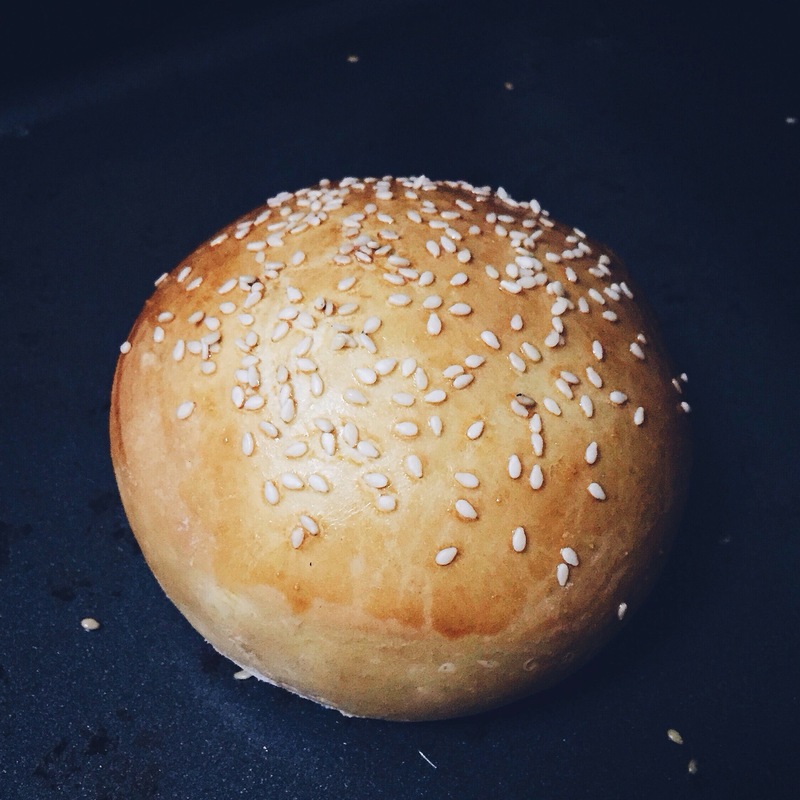 It was one of those really satisfying things and I thought to myself that if there was a zombie apocalypse a la The Walking Dead that my skills of being able to make buns from scratch would ensure that the future world at least has cheeseburger buns. For the beef blend… I wish I had the fancy KitchenAid food grinder but I don’t need any more kitchen stuff at the moment (…is what I tell myself when I can’t justify spending money on more crap for the kitchen). I wound up going to the butcher and they ground me up a mix that was 85% sirloin and 15% chuck. I read a lot about fat content and keeping the beef cold so that fat didn’t smear all over the place and mess up the patty, so when I formed the burger I handled them as little as possible. Apparently I had in my head that the beef would shrink to like half the size, because I made them humungous. I really have no idea was I was thinking — I know meat doesn’t shrink that much but here we are. I guess I was really hungry? The phrase ‘eyes bigger than your stomach’ applies to me always. Perhaps I need to start making things like 50% less than I think they should originally be as I did the same thing with the fish for the fish tacos I made… Anyway, I did remember to press my thumb into the middle so that it wouldn’t cook up into a giant meatball, so at least that’s something. Cast iron pan, got it super hot, salt, pepper, throw on meat. I fought back my natural urge to mindlessly mash it down to make that satisfying crackling hissing sound that cooking meat tends to do, and I turned my attention to the fries, since the burger was going to obviously take a long while. I used Ree Drummond’s recipe so the potatoes were already neatly chopped up and soaking in water, which was then subsequently drained, and I started patting the potatoes as dry as possible as the pot oil heated up. 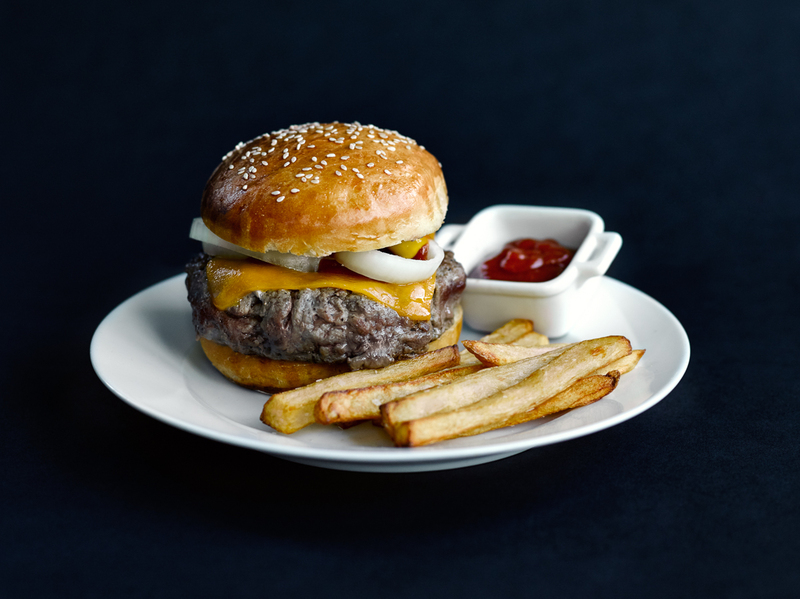 I like my burgers simple – onion, ketchup, mustard, cooked to a nice medium. Normally I’d want a better meat-to-bun ratio and if I got this burger at a restaurant I would think that it was a joke, but once I bit into it I didn’t care about that at all – it was a pretty incredible flavor with the meat blend being mostly sirloin. Or have I finally learned to season things? (Spoiler: I haven’t) Or was it the fresh homemade bun? Which I think I’ve been spoiled by and will have to make every time I want a cheeseburger at home. I wish I had the foresight to freeze the ones that I didn’t use, but nope. I don’t know what it was but I was really happy with how things turned out, even though I only about half of it and hardly any of the fries. The fries were good, but just forgettable. Honestly, if they weren’t in the photo I may have totally forgotten that I even made them. I don’t remember what I was looking at, but I can spend a lot of time mindlessly clicking on recipes as well as reading blogs and browsing sites like Food Gawaker, but I was SOMEWHERE when all of a sudden I saw a recipe that I knew I had to make as soon as I could. The photo showed a canoe-shaped sort of bread bowl thing filled with slightly browned cheese and a runny egg on top. How could that not be the best thing ever? After doing some research I learned that this bread is called Acharuli Khachapuri — a type Georgian cheese bread. Your guess is as good as mine as to the pronunciation (sometimes I just bashfully point at things on the menu at restaurants, plus I’m thinking if I figured out how to pronounce it correctly nobody would know what I was talking about anyway. It probably translates into Amazing Molten Cheese Boat.) The cheese traditionally used in this bread is called sulguni cheese, which from what I can gather is sort of a saltier, little sour/tangy tasting mozzarella. Sounds great, actually. I checked with my beloved local cheesemonger Nickel City Cheese & Mercantile but they didn’t have any, so I figured I would use a different combination. I could have maybe ordered it online but that probably would have meant waiting to make this recipe, which I wasn’t willing to wait any longer than necessary. I thought it would be a nice lunchtime snack-type so I could spend the rest of Saturday wondering why I ate something so incredibly heavy and carb laden that it would make me want to die. The first set of dough I made with all purpose flour as the recipe calls for, but it didn’t give weights, which I should have taken as a warning sign — with how much something can vary with one cup of flour, if you fluff it on top or pack it down, I wished that it had listed the flour in ounces. The little I do know about dough is that weighing ingredients like flour is the way to go so you have an accurate water to flour ratio, so I took the 1 and 1/4 cup measurement and I looked at King Arthur’s website and calculated how much they say a cup of their flour would be and measured it out on the scale. I must have done something wrong (MATH) because the dough never rose and after two and a half hours was a still a giant sticky ectoplasmic mess, so in the garbage it went and I decided my cheesy egg boat dream would have to wait. I was so fixated on having this bread (and as far as I know, there’s no restaurant around here I could go buy it so it seemed like the only way to eat it.) Later in the day I remembered I had some bread flour so I used that and gave it a second go, just for the hell of it, and I’m REALLY glad that I did. I didn’t bother trying to weigh the flour, just went with the cup and a quarter and crossed my fingers that it would be close enough. Right away upon kneading I could tell this dough was going to be different. It was far less sticky and after about an hour doubled in size, just like it should. I’m attempting to at least pretend like I’m going to cut down on buying things for our already cramped (and in need of a makeover) kitchen, but I did recently buy a pizza stone recently. This was my first time using it but I’m sure it won’t be my last and will become a regular tool in the kitchen — it’s amazing how it crisped up this bread so nicely and I’m sure that was the reason why. After letting it cook for roughly fifteen minutes, cracking an egg in the middle and giving it a bit more time in the oven, I carefully maneuvered the loaf off the safety of the pizza stone (I should have bought a pizza paddle when I got the stone — it would have made life a lot easier than the very old and somewhat warped cookie sheet I was using to remove it) and held my breath — secretly impressed with myself that it seemed to look so good and that I got it out of the oven without little too much cheese spill out. I’d like to say we waited for it to cool down before we annihilated it, but we didn’t. This bread has a crunchy crust with chewy bread inside — the little knobby ends of the bread were my favorite part after swirling it around the middle to get it coated in melted cheese and egg. Most kachapuri also calls for some butter to be plopped on top after it came out of the oven, but it wasn’t until the bread was long gone that I remembered it. 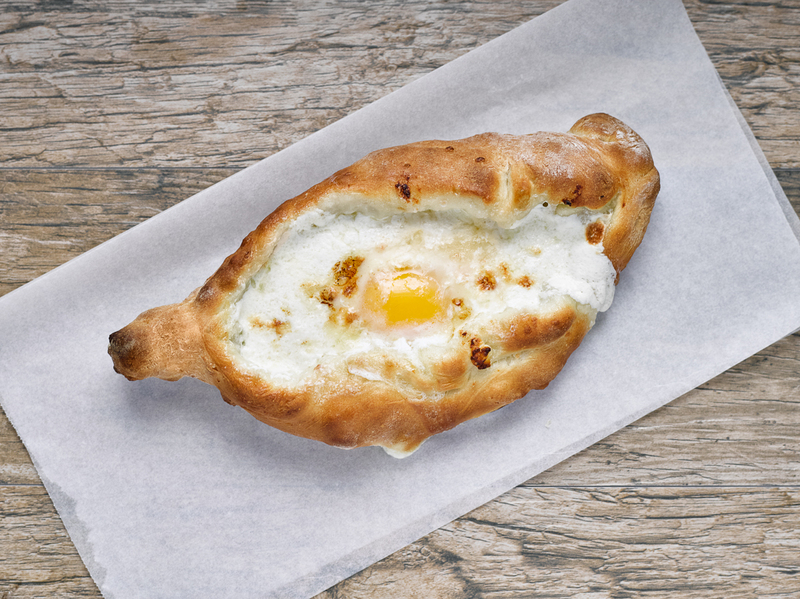 I really want to make the other versions of khachapuri that are out there and hopefully I can track down that specific cheese so I know what it’s really meant to taste like. The version I made was by no means bad, but I’m always interested in comparing to the way things “should” taste. Whether you can find the sulguni cheese or not you should give this recipe a go! I‘ve been chasing down the “perfect” chili since the first time I ever made it (which if you ask my fiancé he will gleefully tell you about how the first time I cooked it I thought I invented this “new recipe). I’m sure I don’t need to tell anybody how long and awful the weather has been this winter — we’ve all been outside having to deal with the cold and ice for months now, and if you live in a climate where that isn’t an issue I’m sure you’ve at least seen plenty of screen caps of the weather app on Instagram, and if that is the case be glad that you live someplace where it doesn’t take 20 minutes to scrape stubborn ice off your windshield before you get to leave your house. It’s very easy to start daydreaming when it’s so crummy outside and my mind keeps wandering to my brother and his family in San Diego, which automatically makes me think about fish tacos. We went to visit in 2013 and my plan was to eat as many fish tacos as I could get my hands on. My plans for taco fulfillment sort of fell through when Luke came down what I can only assume is the plague the second day we were there. (I guess that’s what happens when you’re talking and a little kid decides to cough on your face?) Anyway, instead of tacos and drinks on the patio out in the sun with an ocean view, our vacation quickly turned into vaporizers and me checking on him constantly to make sure he was still alive — it was so bad I wasn’t sure if he was even going to be able to fly when the time came to go home. I didn’t get my fill of tacos but at least I got to see my brother and his family — which is okay because three’s always more vacations and there’s always more tacos. I started to get a little obsessed with fish tacos after that and decided I wanted to try to make them at home, despite the apprehensions I had about having a giant pot of 350 degree pot of oil on my stove. 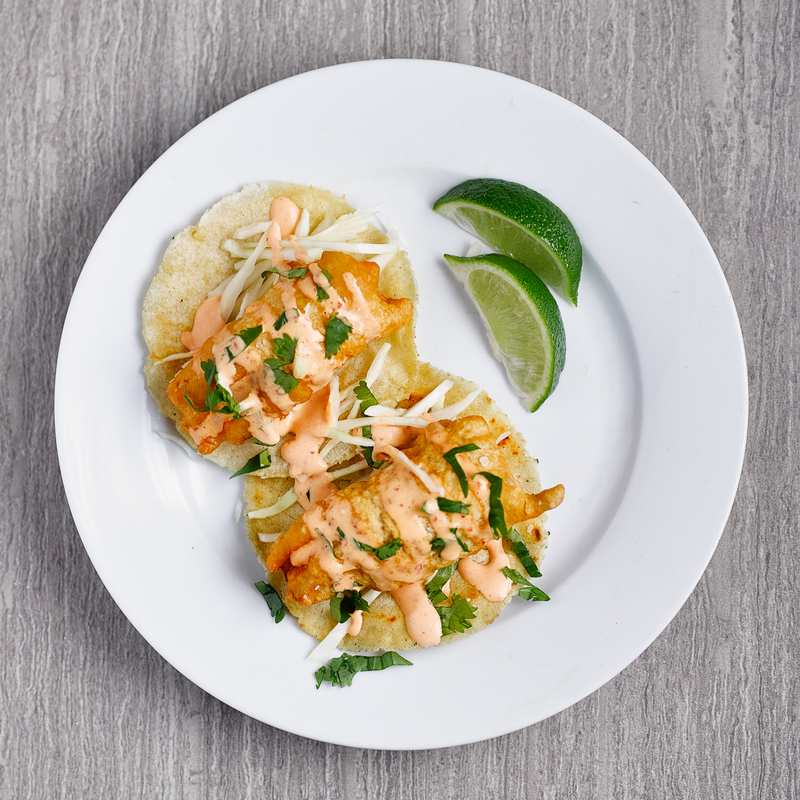 Apparently the idea of crispy fish tacos outweighed my fear of possible third degree burns, so off to the internet I went to research what makes a good fish taco. I quickly learned that people have very strong opinions of what a fish taco should be — I get it though, it’s the same thing I see here in Buffalo when people talk about chicken wings. I wound up reading Slate’s article “You’re Doing It Wrong” (which that title alone means this is a column I should be regularly reading) about fish tacos and decided that that recipe was the way to go. I especially liked that this recipe suggested you do your own tortillas, since one of the few things I really am a stickler on is homemade tortillas — I’m always disappointed when I’m out for Mexican food and the tortillas are store bought, which is more often than not. A good taco can be made with a store bought tortillas, but there’s nothing like freshly pressed and I wish that more places around here did it. The one thing I decided to change was instead of the sauce recipe they had on Slate I decided to use Alton Brown’s crema recipe. When Taco Saturday came (I know normally it’s Taco Tuesday but we like to live every day as if it’s Taco Tuesday) I used a very deep and comically large pot — I figured the more barrier between me and the oil was a good thing. If I had those giant industrial gloves that they clean fryers with I would have worn them. But everything came together quickly once the oil was brought up to temperature – cut fish, dip in the beer batter, set it gently in the oil with it going away from you — that last part was probably the reason why I didn’t wind up with any oil splatter burns and I really wish I remembered where I read it so I could thank that person for saving my arms, otherwise I probably would have went along with my idea of throwing battered fish into the pot from as far away as I could stand. My only annoyance was how the house smelled afterwards — I worked at Burger King in high school and it reminded me of that (not that that was a bad thing — high school job with lots of friends who worked there also, I have great memories of that place), but totally a sacrifice I’d make again! As you can see from the photo I got the tortilla/fish ratio way off, but it didn’t matter, it still tasted balanced. I would make these every day if I could. The citrusy lime reminded me of the sun and the beach — exactly what I needed on a lousy March day when there’s still feet of snow surrounding me. If you’ve never made corn tortillas at home, what are you waiting for? it’s one of those things that is a piece of cake once you get the hang of it. A tortilla press makes the job a breeze — this is the one I have and at only about $14 it’s worth it. Once the fish started frying things came together really quickly and there wouldn’t have been time to roll them by hand. I decided to use mahi mahi for the fish and it crackled and sputtered away in the oil until it was a nice golden brown until it was time to scoop it out, throw some salt on it and let it sit on paper towels to drain a bit. I was really glad I picked up one of these fryer baskets for $6 at the Asian market recently — my original plan was to use tongs since I don’t have a spoon that wouldn’t have melted away upon contact. I kept the tacos very simple — finely shredded cabbage, a sprinkling of cilantro, crema and the corn tortillas, a squeeze of lime. I really think a recipe like this doesn’t need a million garnishes on it — I wanted it to be all about the crispy beer battered fish (which surprisingly didn’t get all soggy and gross). They had a bit of smokiness from the chipotle pepper that was incorporated into the crema – I’d probably leave that out. I’m really not sure what I was thinking when I put it in as I’m really not a fan of smoky-type stuff. But everything else was so good that it didn’t even matter. On my second taco I threw some sliced avocado on and after that it complemented the smoky chipotle flavor nicely. Sitting down to eat these all I could think about was San Diego and lazy vacation and the sun beating down on my face — the tacos were great no matter where i’d be eating them but having that added bonus of for a few minutes forgetting exactly where I was and what the weather was doing outside felt pretty terrific. The fish was crunchy and cooked perfectly — I was patting myself on the back for frying something without burning my face off (and now that I know how to do it my list of stuff I want to cook just grew by about 500 things.) I’d make this recipe again in the blink of an eye. At least it may keep me tied over until I actually get to San Diego again! Sometimes I say something crazy like – “I’m going to make ramen!” and when my fiance Luke hears me say it, he actually takes it as “I’m going to make ramen, I’m totally going to do the thing.” You’d think after being together for almost five years now that he’d know by now that what I really meant was “I might think about making ramen, but who knows if I’ll actually get around to it or become totally distracted by something else like petting a dog or doing laundry or googling how much dream vacations might cost.” One day I was looking at Bon Appetite and offhandedly said I was going to make it, and I knew the moment I said it eventually it was something I was going to have to do because he was so excited. I looked at a lot of recipes for shoyu ramen, but the instructions on the Bon Appetite recipe seemed really straightforward so that was the one I decided to go with. I have a confession… I’ve never had ramen. I don’t mean I’ve never had authentic ramen in a restaurant, I mean I’ve never had ramen ever, including those prepackaged sodium-laden instant noodles microwaved in a styrofoam cup. I know that people go crazy for both, but for some reason I’ve just never gotten around to it on my list of things to try, and it wasn’t a thing in my house growing up so I just didn’t have it. Although I’m sure at any point I could have spent a dollar (or less?) and bought a pack of instant ramen and make it in three minutes, where’s the fun in that, and why not make shoyu ramen that takes three days? Although as I type this David Chang has already proclaimed that the now ubiquitous ramen is dead, I’m more than ready to take on this recipe. First things first, I went off collecting ingredients. I figured that it wouldn’t be too hard to find anything since there’s a plethora of Asian markets in and around Buffalo, and even Wegmans’ international section has a decent selection of stuff. WELL, I wound up having to go to the farmer’s market, Wegmans, and THREE Asian markets! It was mostly due to one ingredient — the dried kombu that is a pretty essential ingredient. If you’re planning on making this, honestly, I would just order it online. I wound up finding it at the expansive Ni Hoowa on Sheridan Drive, and it was only after I got home that I realized it expired 12/2014. Ugh! I made the executive decision that it would still be okay to use, mostly due to me being too lazy to track it down elsewhere or wait for it to be ordered online and shipped — it was the last place I went for it so the thought of going to yet another place (during the hellish winter maelstrom Buffalo is going through right now) wasn’t high on my list. I got the pork from T-Meadow Farms. Pork is such a foreign concept to me — I think I’ve eaten it twice and cooked it once… more on that another time though. It’s stated that the recipe takes three days, which I’m sure scares some people away. The first day is hardly anything, soak this, mix that together — soaking the dried kombu overnight in water makes dashi which you use for the liquid in the stock. The second day was the most involved, browning the pork, then basically dumping in pork ribs, chicken necks and backs, ginger, garlic, bonito flakes, and dashi and simmering for around three hours to make a stock. I was pretty apprehensive about this whole recipe due to my “meh-ness” when it comes to pork, but I have to admit as it all simmered together I was pretty surprised to find myself hovering over the giant stock pot and huffing it. Finally, it was ramen day. With Luke’s help we rolled out the alkaline noodle dough I made — that stuff is TOUGH! Just kneading I felt like my arms got a pretty good workout. We rolled it through what I now know is a very crappy and cheap pasta machine (just another example of you get what you pay for, I suppose.) We did manage to make something that resembled ramen noodles. I was really surprised it worked, I wasn’t expecting it to. I can definitely see how with a good pasta machine it would be pretty simple — KitchenAid pasta roller, I’m looking at you… Anyway, I had everything complete and was feeling pretty confident about how things were shaping up. I put a bowl together and I asked Luke (BTW – did I mention that he’s a professional photographer? And not the “hey, let me take sleazy pictures of you for Model Mayhem kind” but the “earns money from it and pays bills” kind) to take a photo of it… of course you can’t have a food blog without photos. I would make this recipe again in a heartbeat — it was pretty easy and hands-off and it makes a bunch, and if you’re scared off by the time, don’t be, because it’s not too much more involved than making stock, even more so if you buy pre-made noodles. There’s also so many other kinds of ramen that I’m now interested in trying. It’s sort of like pizza — it’s all pizza but there’s many different styles and even more toppings. 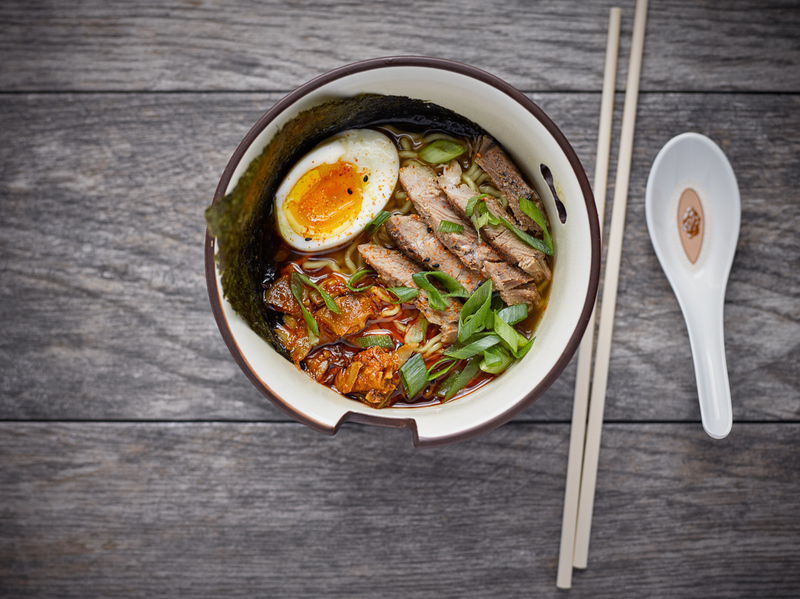 Serious Eats has a great article that really breaks down all the types of toppings, bases, styles, and the differences between them — it really helped me a lot to actually get what ramen was about, because before this I really just viewed it as a sort of noodle soup without realizing how complex it was. I will be making other types of ramen down the road — the hardest part apparently is acquiring the ingredients (unexpired) and successfully keeping nosy pets out of the kitchen. A few years ago I wrote a blog about cooking called 29 and Hungry. I’ve really missed it so I was thinking of reviving it. I thought about keeping the name until I realized how long ago it really was that I was writing it — if I were to start it up again now I’d probably have to call it “33 and Slowly Approaching Death.” This isn’t Live Journal though, so I decided to start all over and call it Queen City Simmer. I would run into people either in real life or on social media who would ask me why I stopped blogging. Do you ever meet those people who are always SO busy but never seem to actually get anything done or finish anything? That’s me. Well, hopefully that WAS me… I’ve gotten a lot better lately at budgeting my time (mostly by paying attention via an app which puts how you spend your time into nifty pie charts, making me realize all the time I totally waste away and where exactly all my time went. As someone who didn’t work a typical 9-5 job it was really eye opening to see where it all went to — there should have been a pie chart slice solely for looking at photos of baby otters doing humanlike things). I’ve finally gotten somewhat of a work/life balance going on which has left me with all this new extra time on my hands. I mean, between taking care of our dogs, renovating our house and shoveling snow that there’s no place left to put, I really felt like I needed something new and fun to focus on a bit, and the idea of blogging about cooking/food kept coming back to me as something I missed doing. It’s funny – I didn’t stop cooking when I stopped blogging, but I stopped trying new ingredients. I’m not sure why writing about stuff made me want to try new things, but it did. I do have some ambitious recipes I want to try out, stuff I’ve never even thought about making before, so it will be interesting to see how things pan out and if it will end in disaster like so many in the past have. Unlike last time I’m not going to make “rules” for myself – anything goes, whatever I want to cook and write about is game. There’s so much food stuff happening in Buffalo right now that I can hardly keep up with it — it’s really awesome to see, but I will still focus mostly on what’s going on in my kitchen here!